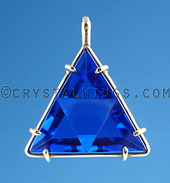 Shop for Ruby Lavender Quartz PendantsHere are some tips for working with Ruby Lavender Quartz. As always, the suggestions serve as only a beginners guide. Hard and fast rules in the crystal world are extremely foolish. You will develop techniques and ideas of your own as you use this stone. 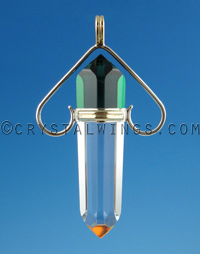 An Amplifier: Although this stone is not the "Clear Quartz" variety, it still has the power and focus to be used as an amplifier like any of your other Vogel Crystals or Master Healing Crystals. The only difference is that it carries with it a suggestive type of energy that always leans toward healing through love, and amplifying your intentions through the lens of the heart. 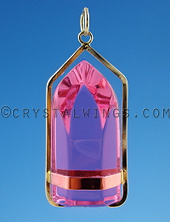 Not limited to the Heart Chakra: Ruby Lavender Quartz does have a commanding heart chakra energy, and does vibrate with that energy center, yet it never remains there. Marcel Vogel felt that the high heart chakra area (located between the Throat Chakra and Heart Chakra) was possibly the ‘doorway to the soul'. This thymus location was the area into which he would bring a crystal into presence with the energy of the body, so one can literally address any physical or emotional issue. Emotional Healing: So many of us are in our heads. We 'think' about things, and make decisions about things as simple as our emotions, or as complex as having to do with our career, based upon the process of the mind. Although Ruby Lavender Quartz can work through the mind, it has tremendous power also working through the heart, or the emotional center. Although Ruby Lavender Quartz can work through the mind, it has tremendous power also working through the heart, or the emotional center. This is especially useful when dealing with emotional toxicity, baggage, or trauma. This stone's mere presence can invoke release, without even thinking about it. Temperature Gauge: Ruby Lavender Quartz can be a gentle warmth that envelops your hand, or a blazing fire that burns away even the most dense and heavy energies. It can be the tender embrace of Kuan Yin, or the electrifying push of Saint Germain to shift to a higher vibration. The intensity of heat is up to you, but RLQ will follow. A Unconditional Friend: When wearing a Ruby Lavender Quartz pendant, or bringing a wand into your home, you have an energy of unconditional love, acceptance, and balance that comes along with you. Most of us, if not all, have moments when our positive inner calm can diminish and almost go out. Perhaps it is a judgment from someone, an argument, or just differing vibrations that will challenge you. 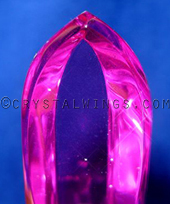 But Ruby Lavender Quartz will offer you, your clients, or anyone whom you are around to bask in a refuge of love.